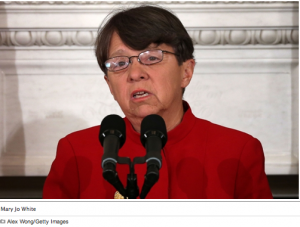 I was shocked when I heard that Mary Jo White, a former U.S. Attorney and a partner for the white-shoe Wall Street defense firm Debevoise and Plimpton, had been named the new head of the SEC. I thought to myself: Couldn’t they have found someone who wasn’t a key figure in one of the most notorious scandals to hit the SEC in the past two decades? And couldn’t they have found someone who isn’t a perfect symbol of the revolving-door culture under which regulators go soft on suspected Wall Street criminals, knowing they have million-dollar jobs waiting for them at hotshot defense firms as long as they play nice with the banks while still in office?